A first visit from this Devonian, He is a fine singer of traditional songs which he ably accompanies on guitar. 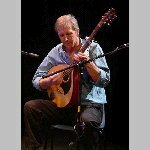 A jack of all trades, some of you may have come across him as a Ceilidh band caller as well as working with such groups as Wistmans Wood and the Eelgrinders. You will get plenty of chances to join in.